Space for 1 team left! 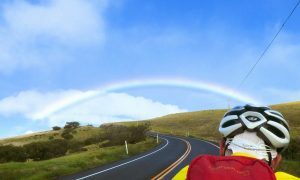 If you are looking to escape the winter – or just want to ride in a REALLY awesome place, Adventures in Tandem’s ride around the Big Island is for you! Our tour begins in the town of Kona. 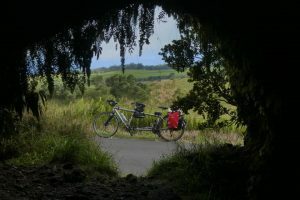 We ride counterclockwise around the island – so you ride closer to the water – visiting a Kona coffee plantation, a pristine black sand beach that is frequently visited by sea turtles, Puuhonau Honaunau National Historical Park and Volcano National Park, lava fields, petroglyphs, cattle country and waterfalls. You will have the opportunity to travel to the top of Mauna Kea, home to one of the largest observatories, the Keck Observatory. You will also have time to snorkel or just relax on our off or low mileage days. Note that this ride is definitely NOT FLAT. Also bear in mind that this ride is early in the season and you may be a bit out of shape at the outset (but probably not at the end). Also you will likely have the opportunity to test out your rain gear, as you know those rainbows don’t appear out of thin air! We will be there to support you and while we expect everyone to ride each day, we will offer a few SAGs to either shorten the ride or take out some of the climb. 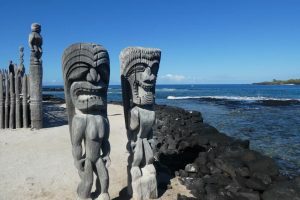 Day 1 We will meet at the Royal Kona Resort in Kailua-Kona, about 10 miles from the airport. Note that there are cabs and Uber to take you from the airport to our start point. If you are traveling with a full sized tandem, we may be able to help you depending on when you arrive. We will assemble bikes, enjoy the lovely resort and have a group dinner. We offer a 20 mile ride around town for those who have the time. 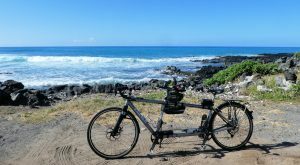 Ride from Kailua-Kona to the town of Captain Cook. British explorer Captain James Cook discovered the Hawaiian Islands in 1778. He also died there. Learn the story behind his discovery and demise. 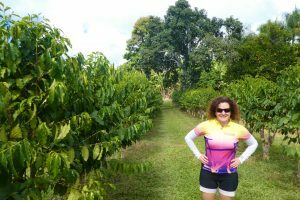 Along the way we will stop at a coffee farm to learn about the farming process, tour the plantation and sample a variety of coffees. Note that though the ride into Captain Cook is a large hill, the total mileage for the day is only 13 miles. 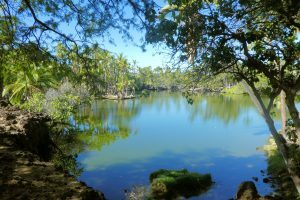 If you are interested in snorkeling and maybe seeing spinner dolphins, you can either hike down to the beach near the Captain Cook Monument or we could shuttle you to the ocean. Dinner will be on your own as there are a number of options in Captain Cook. 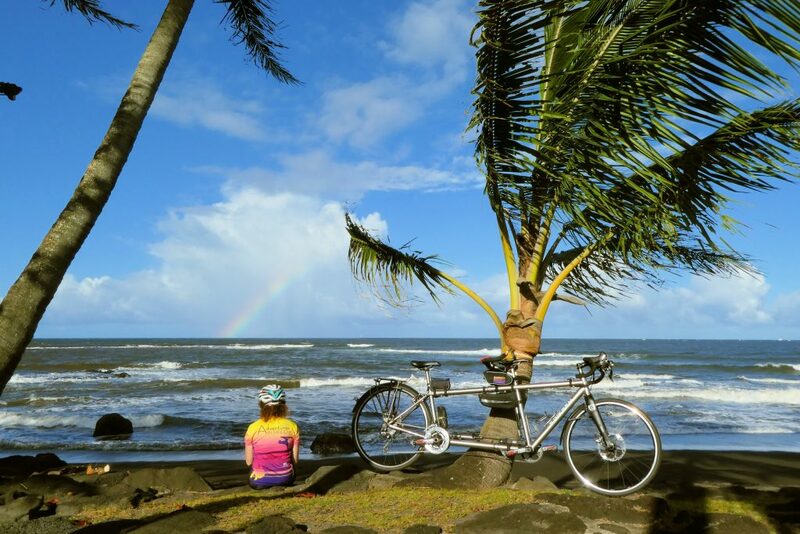 Today’s long ride takes you back down to sea level, including a quiet road to Pu’uhonua O Hōnaunau National Historical Park. You will get to see the famous Painted Church. From there you will continue to the town of Pahala. We also offer a shorter option that skips the drop to sea level and the historical park and hence it leaves out the 500 foot climb out from the park. Our lodging is a short walk to black sand beaches where turtles frequently sunbathe. We are at one of the southern-most points in the United States. There are no nearby shops or restaurants in this remote location. We will enjoy the stars and a picnic dinner of sandwiches, wine and beer at the beach. Day 4 After a continental breakfast at the beach, today’s ride is up, up, up with grades mostly in the 2% to 4% range and an occasional 7% grade. We end in the town of Volcano, just outside of Volcanoes National Park. We will enjoy a group dinner at the historic Kilauea Lodge. Don’t worry. We won’t be riding on this road! Today you can take a rest day and hike through the park or take a short or long spin within Volcanoes National Park either along Crater Rim drive or Hilina Pali Road (which translates to windy cliff, but provides a beautiful overlook at the end). As you may know, there was a large volcanic eruption on the Big Island in the spring of 2018. Where there was active lava flowing in the years leading up to the eruption, currently there are no active lava flows. 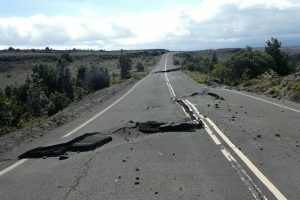 However, we were able to view the effects that the eruption had on the park roads and the Kilauea caldera. You can also talk with people who lived through it. Day 6 E njoy coasting downhill to the town of Hilo. Along the way, stop at the Akatsuka Orchid Gardens. 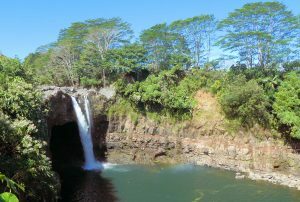 You can also take a short ride to Rainbow Falls. Our hotel is at the end of the Lili’uokalani Park and Gardens and an amazing grove of Banyan trees. Dinner is on your own at the many restaurants in Hilo. 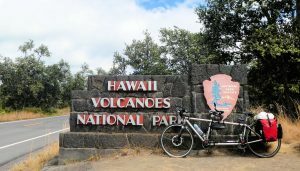 On this layover day you can go for a loop ride, ride to lush waterfalls, lava tubes or caves made from lava, botanical gardens and the Imiloa Astronomy Center and/or rent a 4×4 and drive to the summit of Mauna Kea at 13,803 feet! (Bring something warm as it can be pretty windy and cool at the summit!) You can also rent a regular car and explore the areas of the island that were affected by 2018 eruption. Other options include fishing tour or whale watching tours or even a helicopter island tour. The view from a lava tube. We leave Hilo enroute to Waimea. The riding is lovely along the eastern coastline. The first 30 miles are relatively flat, but then hills kick in as our route takes us away from the shoreline. We take you off the main road to the Old Mamalahoa Highway. This is a very quiet road which takes you through the cattle raising country. You will be amazed by the change in scenery. In the morning you will be riding in lush rainforests, but by the afternoon, you will ride along arid grasslands. You will even pass by a few lava tubes that you can explore. We will be around with the van to provide support if you need it. We end the day in the small town of Waimea where we will enjoy a group dinner. 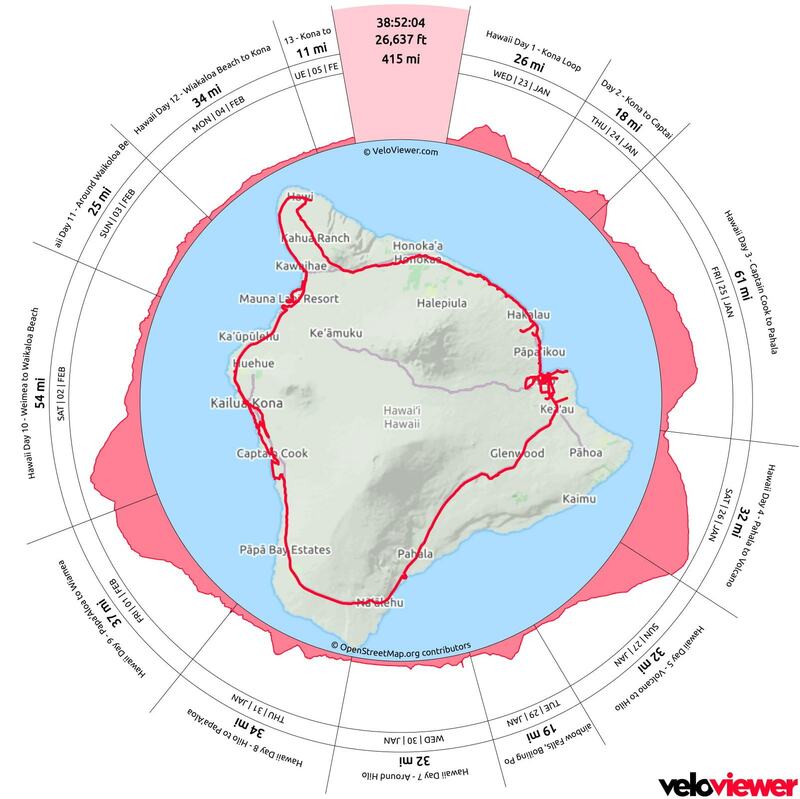 Day 9 On this last day of riding, we will ride to the town of Hawi, at the northernmost point on the island. The initial ride is a climb, but then there is a glorious descent. You can explore the galleries and boutiques in these artsy towns. Also check out the King Kamehameha statue in Kapauu. The last part of the ride is along the shore where we will be riding part of the iconic Hawaiian Iron Man route that is done every October. We end the day at the Waikoloa Beach Marriott Resort and Spa. We will reunite you with your bike cases and we will enjoy a party of taking apart bikes. We will celebrate our final night with dinner together. On Day 10, you can continue your adventure by adding days at the Marriott or by traveling to one or more of the other islands. Note that it is possible to ship your bike back to the States. The cost of shipping to the mainland is quite reasonable. Then you will be able to extend your trip without dragging along a bike. The Big Island is a very hilly place! Just to give you an idea of what the hills look like, this image shows all the riding we did on our scouting trip. You can click on it to see it in more detail. The hills were especially challenging for us as we were on a loaded bike. You don’t have to do quite as much riding on the tour and we carry your luggage for you! This is a nine night trip. The cost is $6,600 per couple ($3,300 per person). We limit the size of our tours to be no more than ten couples. We only accept couples on tandem bikes. Come join us! Note that we do not provide any bicycles. We expect that you have a tandem that is in good working order and that you are able to assemble your bike. If you do not have your own tandem, you can rent a coupled tandem from Mel at Tandems East. If you live on the West Coast, you might want to consider renting a bike from Mark at Tandem Diversity. Both Mel and Mark sell tandems, so if you end up renting from them, you might get a discount if you purchase a bike from them. If you have a tandem that is not coupled it is possible to bring it, but you should make sure that all of your flights could handle the larger box. Lastly, Adventures in Tandem has a coupled hybrid tandem that we can rent you if the sizing works out. Email us for more details. 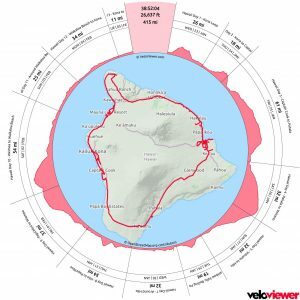 Note that we noticed that the cost to ship a bike from Hawaii back to the mainland is about half the cost to ship from the mainland to Hawaii. So feel free to ship your bike back and you can easily extend your trip without having to lug your bike. What is the average mileage per day? Required rides range from 13 to 61 miles with the average mileage being 38, but it’s hilly. We believe that there is enough to see so that more miles may prevent you from fully enjoying the culture and beauty of the area. That said, we can work with you if you would like to ride more miles. Bear in mind, though, that we will not be providing SAG support for these extra miles, except in an emergency, if you are off the main route. While this could change, here are the inns and hotels that we plan to stay in.